This is absolutely true, as they will set tag allocations which directly affects the number of deer removed each season. But, with that being said, they are not forcing hunters to kill deer. Sure, we can legally harvest a deer for every tag we possess, but that doesn’t mean that we have to. It may sound crazy, but is it possible that we (the hunters) are actually responsible for the decreasing deer numbers? Before you start “raging” comments at me, give me a chance to explain. Every year, we buy a hunting license and deer tags. Some states will have an application process which regulates licenses sold, while others are easy to acquire over-the-counter. Much of the regulatory authority by state agencies revolves around the number of antlerless deer to be harvested. This is typically based on certain conditions and goals. In other words, is the state looking to increase, decrease, or stabilize deer numbers in an area? So a certain amount of antlerless tags are allocated for sale. Many hunters have pointed to the distribution of high numbers of antlerless tags as a big reason for deer herd declines. I agree with the statement. I think there have been areas where too many does have been removed. However, the state agency did not shoot the deer … hunters did. One of the things about deer hunting is that nearly 70 percent of it is done on privately owned land, which is land that we, as hunters, can regulate harvests. 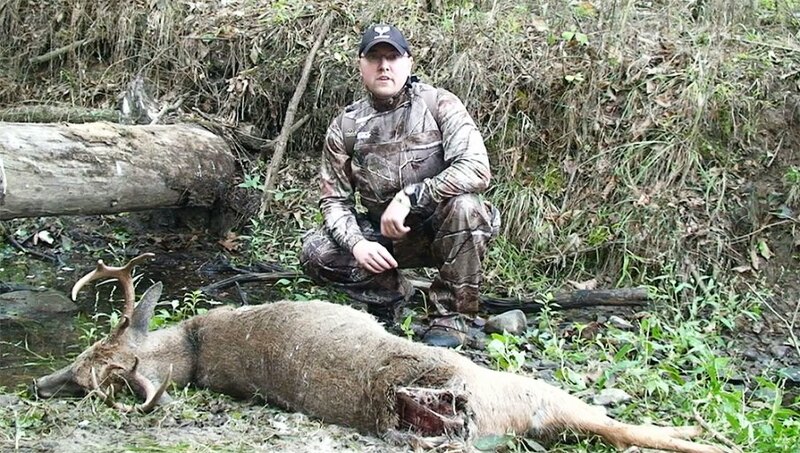 Just because the state allows us to shoot, let’s say a doe a day or three per season, does not mean that the herd can withstand that harvest rate. When we hunt, we have the responsibility to manage the resource (deer); every time we pull that trigger or release that arrow, it is a management decision. That being said, many of us still have the “If I don’t shoot it, someone else will” mindset. Sometimes that is true, and there is nothing we can do about it. But, if we don’t give the deer a chance, then its chances increase to 100 percent that it will not make it through the season. We also can’t control what our neighbors are doing. That is so true. I almost thought I was going to have to say it twice. Many of us have experienced the “if it’s brown, it’s down” neighbor. Unfortunately, they do more than their share of harvesting. In these situations, true hunters and deer managers will need to opt for the high road, conceding the fact that there are likely enough antlerless deer being removed that we should not harvest any. It’s flat out not fair, but if we go ahead and harvest a few, then we are just aiding in the decline of the herd. Public land is a different story, as we can’t control what the “other” guy does. You know, the one that walks in at daybreak, clearly sees us, but still decides to sit 50 yards away. But if you are not seeing deer or absolutely know sightings are going down each season, then why remove a doe when she could add two or more deer into the population the following year? Heck, in these cases, shoot a button buck if you need meat. It’s likely not going to breed, it surely isn’t going to be bred (if I am still up on my anatomy), and so it is the best deer to harvest in a low deer number situation. Yes, it could be a basket rack next season or a future “Booner” in four years, but at that moment it is the most logical deer to remove. No, I’m not encouraging everyone who believes their herd is declining to shoot button bucks. I am simply saying that removing them as an antlerless deer in declining herds is better than an adult doe that could help add to the population. So before we jump all over state agencies for “mismanagement” of the deer herd, we need to look inside our own group as hunters, and even ourselves, to make sure we are doing everything possible to help the herd rebound. When we head into the field, we’re the ones choosing to remove deer from the herd. Just because it’s legal, does not mean it is the right decision.